RIO DE JANEIRO—Beating out Serbian Nikola Jokic by .87 points in order to claim the all-around title, U.S. forward Kevin Durant won Olympic gold Friday in men’s individual basketball, becoming the first man to win consecutive golds in the competition since Gary Payton at the 1996 and 2000 Games. “After securing a 15.23 in the ball-handling portion and a near-perfect 15.89 in the shooting section, Durant just needed to nail a few solid dunks to secure victory, and he did just that,” said NBC Olympic basketball analyst Doug Collins, adding that the gold medal hopes of eventual bronze medalist Jose Calderon of Spain were immediately extinguished after Durant laid down an impeccable two-handed reverse slam, gracefully landing on the court with complete balance and precision. “Durant had flawless form during his crossovers and spin moves, and then he capped it all off with a triple pump fake into a string of very difficult sky hooks. 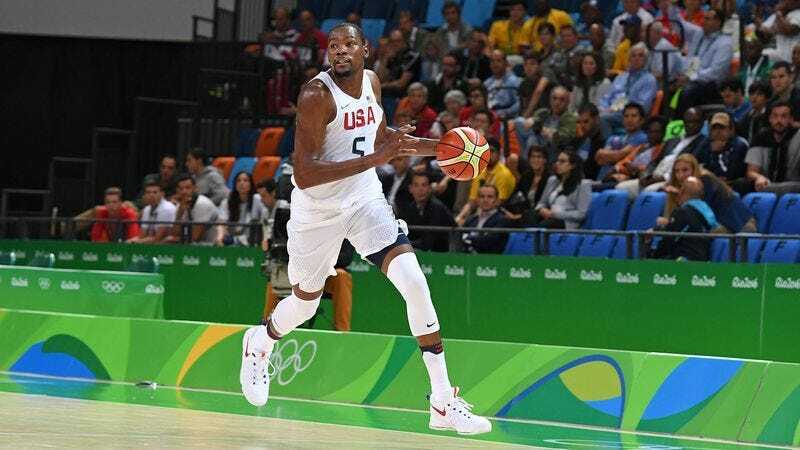 It was a real joy to watch.” Sources also confirmed that Durant’s U.S. teammate Carmelo Anthony fell agonizingly short of medaling after stumbling while attempting to complete a one-handed fadeaway jumper.